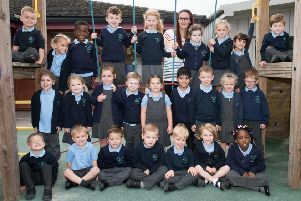 For this week’s My First Class feature we are focusing on a third Aylesbury primary school. Ashmead Combined School based in Cole Road, Aylesbury, has three Reception classes. These groups are named after their class teacher so we have Miss Sherwood’s class, Mrs Amin’s class and Miss Larter/Mrs Allan’s class. If you would like your child’s school to be featured in the My First Class section next week e-mail neil.shefferd@jpress.co.uk.